ขนาดมวล: 1.67×10−27 ถึง 4.52×10−25 กก. ถึงแม้จะเป็นอะตอมที่มีมวลมากที่สุด มันก็ยังเบาเกินกว่าที่เราจะไปทำอะไรด้วยโดยตรงได้ นักเคมีจึงนิยมใช้หน่วย โมล แทน โมลมีนิยามว่า หนึ่งโมลของธาตุใด ๆ จะมีจำนวนอะตอมเท่ากันเสมอ (ประมาณ 6.022×1023) ที่เลือกใช้จำนวนนี้ก็เพื่อว่า ถ้าธาตุใด ๆ มีเลขอะตอมเป็น 1 u แล้ว โมลอะตอมของธาตุนั้นจะมีมวลใกล้เคียงกับ 0.001 กก. หรือ 1 กรัม อาศัยคำนิยามของหน่วยมวลอะตอมนี้ คาร์บอน-12 จึงมีมวลอะตอมเท่ากับ 12 u พอดี และหนึ่งโมลของอะตอมคาร์บอนมีน้ำหนักเท่ากับ 0.012 กก. ↑ Leigh, G. J., ed. (1990). International Union of Pure and Applied Chemistry, Commission on the Nomenclature of Inorganic Chemistry, Nomenclature of Organic Chemistry - Recommendations 1990. Oxford: Blackwell Scientific Publications. p. 35. ISBN 0-08-022369-9. An atom is the smallest unit quantity of an element that is capable of existence whether alone or in chemical combination with other atoms of the same or other elements. ↑ Haubold, Hans; Mathai, A.M. (1998). "Microcosmos: From Leucippus to Yukawa". Structure of the Universe. สืบค้นเมื่อ 2008-01-17. ↑ "Radioactive Decays". Stanford Linear Accelerator Center. 15 June 2009. สืบค้นเมื่อ 2009-07-04. ↑ Ponomarev, Leonid Ivanovich (1993). The Quantum Dice. CRC Press. ISBN 0-7503-0251-8. OCLC 26853108. ↑ Moran 2005, p. 146. ↑ 10.0 10.1 Levere 2001, p. 7. ↑ Pratt, Vernon (September 28, 2007). "The Mechanical Philosophy". Reason, nature and the human being in the West. สืบค้นเมื่อ 2009-06-28. ↑ Siegfried 2002, pp. 42–55. ↑ Kemerling, Garth (August 8, 2002). "Corpuscularianism". Philosophical Dictionary. สืบค้นเมื่อ 2009-06-17. ↑ "Lavoisier's Elements of Chemistry". Elements and Atoms. Le Moyne College, Department of Chemistry. สืบค้นเมื่อ 2007-12-18. ↑ "J.J. Thomson". Nobel Foundation. 1906. สืบค้นเมื่อ 2007-12-20. ↑ Rutherford, E. (1911). "The Scattering of α and β Particles by Matter and the Structure of the Atom" (PDF). Philosophical Magazine. 21: 669–88. ↑ "Frederick Soddy, The Nobel Prize in Chemistry 1921". Nobel Foundation. สืบค้นเมื่อ 2008-01-18. ↑ Thomson, Joseph John (1913). "Rays of positive electricity". Proceedings of the Royal Society. A 89: 1–20. ↑ Stern, David P. (16 May 2005). "The Atomic Nucleus and Bohr's Early Model of the Atom". NASA/Goddard Space Flight Center. สืบค้นเมื่อ 2007-12-20. ↑ Bohr, Neils (11 December 1922). "Niels Bohr, The Nobel Prize in Physics 1922, Nobel Lecture". Nobel Foundation. สืบค้นเมื่อ 2008-02-16. ↑ Lewis, Gilbert N. (1916). "The Atom and the Molecule". Journal of the American Chemical Society. 38 (4): 762–786. doi:10.1021/ja02261a002. ↑ Langmuir, Irving (1919). "The Arrangement of Electrons in Atoms and Molecules". Journal of the American Chemical Society. 41 (6): 868–934. doi:10.1021/ja02227a002. ↑ Scully, Marlan O.; Lamb, Willis E.; Barut, Asim (1987). "On the theory of the Stern-Gerlach apparatus". Foundations of Physics. 17 (6): 575–583. doi:10.1007/BF01882788. ↑ Brown, Kevin (2007). "The Hydrogen Atom". MathPages. สืบค้นเมื่อ 2007-12-21. ↑ Harrison, David M. (2000). "The Development of Quantum Mechanics". University of Toronto. สืบค้นเมื่อ 2007-12-21. ↑ Aston, Francis W. (1920). "The constitution of atmospheric neon". Philosophical Magazine. 39 (6): 449–55. ↑ Chadwick, James (12 December 1935). "Nobel Lecture: The Neutron and Its Properties". Nobel Foundation. สืบค้นเมื่อ 2007-12-21. ↑ "Otto Hahn, Lise Meitner and Fritz Strassmann". Chemical Achievers: The Human Face of the Chemical Sciences. Chemical Heritage Foundation. สืบค้นเมื่อ 2009-09-15. ↑ Meitner, Lise; Frisch, Otto Robert (1939). "Disintegration of uranium by neutrons: a new type of nuclear reaction". Nature. 143: 239. doi:10.1038/143239a0. ↑ Crawford, E.; Sime, Ruth Lewin; Walker, Mark (1997). "A Nobel tale of postwar injustice". Physics Today. 50 (9): 26–32. doi:10.1063/1.881933. ↑ Kullander, Sven (28 August 2001). "Accelerators and Nobel Laureates". Nobel Foundation. สืบค้นเมื่อ 2008-01-31. ↑ "The Nobel Prize in Physics 1990". Nobel Foundation. 17 October 1990. สืบค้นเมื่อ 2008-01-31. ↑ Particle Data Group (2002). "The Particle Adventure". Lawrence Berkeley Laboratory. สืบค้นเมื่อ 2007-01-03. ↑ Schombert, James (April 18, 2006). "Elementary Particles". University of Oregon. สืบค้นเมื่อ 2007-01-03. ↑ Wenner, Jennifer M. (October 10, 2007). "How Does Radioactive Decay Work?". Carleton College. สืบค้นเมื่อ 2008-01-09. ↑ 52.0 52.1 52.2 Raymond, David (April 7, 2006). "Nuclear Binding Energies". New Mexico Tech. สืบค้นเมื่อ 2007-01-03. ↑ Mihos, Chris (July 23, 2002). "Overcoming the Coulomb Barrier". Case Western Reserve University. สืบค้นเมื่อ 2008-02-13. ↑ Staff (March 30, 2007). "ABC's of Nuclear Science". Lawrence Berkeley National Laboratory. สืบค้นเมื่อ 2007-01-03. ↑ Shultis et al. (2002:72–6). ↑ Fewell, M. P. (1995). "The atomic nuclide with the highest mean binding energy". American Journal of Physics. 63 (7): 653–58. doi:10.1119/1.17828. สืบค้นเมื่อ 2007-02-01. ↑ Mulliken, Robert S. (1967). "Spectroscopy, Molecular Orbitals, and Chemical Bonding". Science. 157 (3784): 13–24. doi:10.1126/science.157.3784.13. PMID 5338306. ↑ 59.0 59.1 Brucat, Philip J. (2008). "The Quantum Atom". University of Florida. สืบค้นเมื่อ 2007-01-04. ↑ Manthey, David (2001). "Atomic Orbitals". Orbital Central. สืบค้นเมื่อ 2008-01-21. ↑ Herter, Terry (2006). "Lecture 8: The Hydrogen Atom". Cornell University. สืบค้นเมื่อ 2008-02-14. ↑ Bell, R. E.; Elliott, L. G. (1950). "Gamma-Rays from the Reaction H1 (n, γ) D2 and the Binding Energy of the Deuteron". Physical Review. 79 (2): 282–285. doi:10.1103/PhysRev.79.282. ↑ Matis, Howard S. (August 9, 2000). "The Isotopes of Hydrogen". Guide to the Nuclear Wall Chart. Lawrence Berkeley National Lab. สืบค้นเมื่อ 2007-12-21. ↑ Weiss, Rick (October 17, 2006). "Scientists Announce Creation of Atomic Element, the Heaviest Yet". Washington Post. สืบค้นเมื่อ 2007-12-21. ↑ 66.0 66.1 Sills (2003:131–134). ↑ Dumé, Belle (April 23, 2003). "Bismuth breaks half-life record for alpha decay". Physics World. สืบค้นเมื่อ 2007-12-21. ↑ Lindsay, Don (July 30, 2000). "Radioactives Missing From The Earth". Don Lindsay Archive. สืบค้นเมื่อ 2007-05-23. ↑ 69.0 69.1 CRC Handbook (2002). ↑ 70.0 70.1 Mills et al. (1993). ↑ Chieh, Chung (January 22, 2001). "Nuclide Stability". University of Waterloo. สืบค้นเมื่อ 2007-01-04. ↑ "Atomic Weights and Isotopic Compositions for All Elements". National Institute of Standards and Technology. สืบค้นเมื่อ 2007-01-04. ↑ Audi, G. (2003). "The Ame2003 atomic mass evaluation (II)". Nuclear Physics A. 729: 337–676. doi:10.1016/j.nuclphysa.2003.11.003. สืบค้นเมื่อ 2008-02-07. ↑ Shannon, R. D. (1976). "Revised effective ionic radii and systematic studies of interatomic distances in halides and chalcogenides". Acta Crystallographica, Section a. 32: 751. doi:10.1107/S0567739476001551. สืบค้นเมื่อ 2007-01-03. ↑ Dong, Judy (1998). 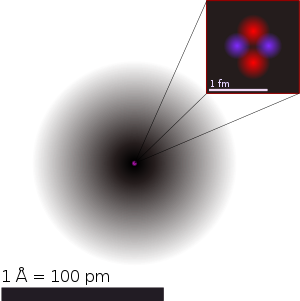 "Diameter of an Atom". The Physics Factbook. สืบค้นเมื่อ 2007-11-19. ↑ Bethe, H. (1929). "Termaufspaltung in Kristallen". Annalen der Physik, 5. Folge. 3: 133. ↑ Staff (2007). "Small Miracles: Harnessing nanotechnology". Oregon State University. สืบค้นเมื่อ 2007-01-07. —describes the width of a human hair as 105 nm and 10 carbon atoms as spanning 1 nm. ↑ Padilla et al. (2002:32) —"There are 2,000,000,000,000,000,000,000 (that's 2 sextillion) atoms of oxygen in one drop of water—and twice as many atoms of hydrogen." ↑ 82.0 82.1 "Radioactivity". Splung.com. สืบค้นเมื่อ 2007-12-19. ↑ Firestone, Richard B. (May 22, 2000). "Radioactive Decay Modes". Berkeley Laboratory. สืบค้นเมื่อ 2007-01-07. ↑ Hornak, J. P. (2006). "Chapter 3: Spin Physics". The Basics of NMR. Rochester Institute of Technology. สืบค้นเมื่อ 2007-01-07. ↑ 86.0 86.1 Schroeder, Paul A. (February 25, 2000). "Magnetic Properties". University of Georgia. Archived from the original on 2007-04-29. สืบค้นเมื่อ 2007-01-07. ↑ Goebel, Greg (September 1, 2007). "[4.3] Magnetic Properties of the Atom". Elementary Quantum Physics. In The Public Domain website. สืบค้นเมื่อ 2007-01-07. ↑ Yarris, Lynn (Spring 1997). "Talking Pictures". Berkeley Lab Research Review. สืบค้นเมื่อ 2008-01-09. ↑ Liang and Haacke (1999:412–26). ↑ Zeghbroeck, Bart J. Van (1998). "Energy levels". Shippensburg University. Archived from the original on January 15, 2005. สืบค้นเมื่อ 2007-12-23. ↑ "Atomic Emission Spectra — Origin of Spectral Lines". Avogadro Web Site. สืบค้นเมื่อ 2006-08-10. ↑ Fitzpatrick, Richard (February 16, 2007). "Fine structure". University of Texas at Austin. สืบค้นเมื่อ 2008-02-14. ↑ Weiss, Michael (2001). "The Zeeman Effect". University of California-Riverside. สืบค้นเมื่อ 2008-02-06. ↑ Watkins, Thayer. "Coherence in Stimulated Emission". San José State University. สืบค้นเมื่อ 2007-12-23. ↑ Reusch, William (July 16, 2007). "Virtual Textbook of Organic Chemistry". Michigan State University. สืบค้นเมื่อ 2008-01-11. ↑ "Covalent bonding – Single bonds". chemguide. 2000. ↑ Baum, Rudy (2003). "It's Elemental: The Periodic Table". Chemical & Engineering News. สืบค้นเมื่อ 2008-01-11. ↑ Goodstein 2002, pp. 436–438. ↑ Brazhkin, Vadim V. (2006). "Metastable phases, phase transformations, and phase diagrams in physics and chemistry". Physics-Uspekhi. 49 (7): 719–24. doi:10.1070/PU2006v049n07ABEH006013. ↑ Myers 2003, p. 85. ↑ Staff (October 9, 2001). "Bose-Einstein Condensate: A New Form of Matter". National Institute of Standards and Technology. สืบค้นเมื่อ 2008-01-16. ↑ "The Nobel Prize in Physics 1986". The Nobel Foundation. สืบค้นเมื่อ 2008-01-11. —in particular, see the Nobel lecture by G. Binnig and H. Rohrer. ↑ Jakubowski, N. (1998). "Sector field mass spectrometers in ICP-MS". Spectrochimica Acta Part B: Atomic Spectroscopy. 53 (13): 1739–63. Bibcode:1998AcSpe..53.1739J. doi:10.1016/S0584-8547 (98) 00222-5 Check |doi= value (help). ↑ Müller, Erwin W.; Panitz, John A.; McLane, S. Brooks (1968). "The Atom-Probe Field Ion Microscope". Review of Scientific Instruments. 39 (1): 83–86. Bibcode:1968RScI...39...83M. doi:10.1063/1.1683116. ↑ Winter, Mark (2007). "Helium". WebElements. สืบค้นเมื่อ 2008-01-03. ↑ Hinshaw, Gary (February 10, 2006). "What is the Universe Made Of?". NASA/WMAP. สืบค้นเมื่อ 2008-01-07. ↑ Choppin, Liljenzin & Rydberg 2001, p. 441. ↑ Davidsen, Arthur F. (1993). "Far-Ultraviolet Astronomy on the Astro-1 Space Shuttle Mission". Science. 259 (5093): 327–34. Bibcode:1993Sci...259..327D. doi:10.1126/science.259.5093.327. PMID 17832344. ↑ Lequeux 2005, p. 4. ↑ Smith, Nigel (January 6, 2000). "The search for dark matter". Physics World. สืบค้นเมื่อ 2008-02-14. ↑ Croswell, Ken (1991). "Boron, bumps and the Big Bang: Was matter spread evenly when the Universe began? Perhaps not; the clues lie in the creation of the lighter elements such as boron and beryllium". New Scientist (1794): 42. สืบค้นเมื่อ 2008-01-14. ↑ Copi, Craig J.; Schramm, DN; Turner, MS (1995). "Big-Bang Nucleosynthesis and the Baryon Density of the Universe". Science. 267 (5195): 192–99. arXiv:astro-ph/9407006. Bibcode:1995Sci...267..192C. doi:10.1126/science.7809624. PMID 7809624. ↑ Hinshaw, Gary (December 15, 2005). "Tests of the Big Bang: The Light Elements". NASA/WMAP. สืบค้นเมื่อ 2008-01-13. ↑ Abbott, Brian (May 30, 2007). "Microwave (WMAP) All-Sky Survey". Hayden Planetarium. สืบค้นเมื่อ 2008-01-13. ↑ Hoyle, F. (1946). "The synthesis of the elements from hydrogen". Monthly Notices of the Royal Astronomical Society. 106: 343–83. Bibcode:1946MNRAS.106..343H. ↑ Knauth, D. C.; Knauth, D. C.; Lambert, David L.; Crane, P. (2000). "Newly synthesized lithium in the interstellar medium". Nature. 405 (6787): 656–58. doi:10.1038/35015028. PMID 10864316. ↑ Mashnik, Stepan G. (2000). "On Solar System and Cosmic Rays Nucleosynthesis and Spallation Processes". arΧiv:[[arXiv:|]] [astro-ph]. ↑ Kansas Geological Survey (May 4, 2005). "Age of the Earth". University of Kansas. สืบค้นเมื่อ 2008-01-14. ↑ 126.0 126.1 Manuel 2001, pp. 407–430,511–519. ↑ Dalrymple, G. Brent (2001). "The age of the Earth in the twentieth century: a problem (mostly) solved". Geological Society, London, Special Publications. 190 (1): 205–21. doi:10.1144/GSL.SP.2001.190.01.14. สืบค้นเมื่อ 2008-01-14. ↑ Pennicott, Katie (May 10, 2001). "Carbon clock could show the wrong time". PhysicsWeb. สืบค้นเมื่อ 2008-01-14. ↑ Yarris, Lynn (July 27, 2001). "New Superheavy Elements 118 and 116 Discovered at Berkeley Lab". Berkeley Lab. สืบค้นเมื่อ 2008-01-14. ↑ Poston Sr., John W. (March 23, 1998). "Do transuranic elements such as plutonium ever occur naturally?". Scientific American. สืบค้นเมื่อ 2008-01-15. ↑ Keller, C. (1973). "Natural occurrence of lanthanides, actinides, and superheavy elements". Chemiker Zeitung. 97 (10): 522–30. OSTI 4353086. ↑ Zaider & Rossi 2001, p. 17. ↑ "Oklo Fossil Reactors". Curtin University of Technology. สืบค้นเมื่อ 2008-01-15. ↑ Weisenberger, Drew. "How many atoms are there in the world?". Jefferson Lab. สืบค้นเมื่อ 2008-01-16. ↑ Pidwirny, Michael. "Fundamentals of Physical Geography". University of British Columbia Okanagan. สืบค้นเมื่อ 2008-01-16. ↑ Anonymous (October 2, 2001). "Second postcard from the island of stability". CERN Courier. สืบค้นเมื่อ 2008-01-14. ↑ Jacoby, Mitch (2006). "As-yet-unsynthesized superheavy atom should form a stable diatomic molecule with fluorine". Chemical & Engineering News. 84 (10): 19. ↑ Koppes, Steve (March 1, 1999). "Fermilab Physicists Find New Matter-Antimatter Asymmetry". University of Chicago. สืบค้นเมื่อ 2008-01-14. ↑ Cromie, William J. (August 16, 2001). "A lifetime of trillionths of a second: Scientists explore antimatter". Harvard University Gazette. สืบค้นเมื่อ 2008-01-14. ↑ Hijmans, Tom W. (2002). "Particle physics: Cold antihydrogen". Nature. 419 (6906): 439–40. doi:10.1038/419439a. PMID 12368837. ↑ Staff (October 30, 2002). "Researchers 'look inside' antimatter". BBC News. สืบค้นเมื่อ 2008-01-14. ↑ Barrett, Roger (1990). "The Strange World of the Exotic Atom". New Scientist (1728): 77–115. สืบค้นเมื่อ 2008-01-04. ↑ Indelicato, Paul (2004). "Exotic Atoms". Physica Scripta. T112 (1): 20–26. arXiv:physics/0409058. Bibcode:2004PhST..112...20I. doi:10.1238/Physica.Topical.112a00020. Francis, Eden (2002). "Atomic Size (ขนาดของอะตอม)". Clackamas Community College. สืบค้นเมื่อ 2007-01-09. Freudenrich, Craig C. "How Atoms Work (อะตอมทำงานอย่างไร)". How Stuff Works. สืบค้นเมื่อ 2007-01-09. "Atom:The Atom". Free High School Science Texts: Physics. Wikibooks. สืบค้นเมื่อ 2007-01-09. Anonymous (2007). "The atom". Science aid+. สืบค้นเมื่อ 2007-01-09. —a guide to the atom for teens. Anonymous (2006-01-03). "Atoms and Atomic Structure (อะตอมกับโครงสร้างอะตอม)". BBC. สืบค้นเมื่อ 2007-01-11. Various (2006-01-03). "Physics 2000, Table of Contents". University of Colorado. สืบค้นเมื่อ 2008-01-11. Various (2006-02-03). "What does an atom look like? (อะตอมมีหน้าตาอย่างไร)". University of Karlsruhe. สืบค้นเมื่อ 2008-05-12. หน้านี้แก้ไขล่าสุดเมื่อวันที่ 10 เมษายน 2562 เวลา 13:40 น.